Nomi's Ark is a cedar-paneled, two-bedroom, Manzanita vacation home which promises high style with all the comforts of home. This cozy, yet spacious home, is the perfect beach getaway! Step into the warm and beautifully appointed living room featuring comfortable furniture arranged around a beautiful, wood-burning fireplace. Cuddle up on the couch to watch your favorite movies on the 50" flat screen TV. If TV doesn't interest you, grab one of the many board games or card games and have a fun family game night. The recently updated kitchen is fully equipped and will delight the chef of the group! This bright and roomy space is a delight to work in whether you are preparing a seafood feast or a light brunch. The dining table is surrounded by daylight windows and seats up to six people comfortably. This spacious home promises comfortable sleeping accommodations for up to four adults with a maximum occupancy of six. When it's time to turn in, you'll find that the first bedroom is just as carefully appointed as the living area. There is a comfortable king size bed with beautiful end tables, reading lamps and plush, designer linens. The second bedroom features a queen size bed, lovely dresser, pillows galore, and great lighting. A custom, remodeled bathroom is located between the two bedrooms. Nearby is a floor to ceiling bookcase filled with all kinds of reading material and board games. While the inside of the home is uniquely warm and beautiful, the landscaped and fully fenced back yard offers the perfect place to enjoy the outdoor environment. Relax in the hot tub after a long day on the beach. There's also a charcoal grill for that summer cookout before heading down to the beach to watch the sunset. 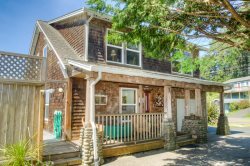 Located right in the heart of Manzanita, this gorgeous Oregon Coast vacation home is 1/2 block from the beach and less then a block to town. Manzanita is a hidden treasure filled with boutiques, restaurants, galleries and a seven-mile stretch of quiet, sandy beach. For those that seek a little more adventure, Oswald State Park - located just north of Manzanita - provides an excellent surfing beach, as well as beautiful hiking trails and view points. You can take in the most beautiful view on the coast from the top of nearby Neahkahnie Mountain. A vacation stay with us promises an unforgettable experience whether you are looking for outdoor adventures or time in front of the fire with family and friends. This sweet town and magnificent part of the Oregon coast provide it all and our lovely vacation homes will make your beach getaway memorable for a lifetime. Nomi's Ark is sure to be a fast favorite and your go-to vacation rental in Manzanita! One dog allowed, must be at least two years of age, and flea treated before arrival. All my communication was via email so hard to comment on your team. I think our favorite thing was the coziness and instant feel of being home We had a perfect weekend and it was exactly what we were looking for and look forward to our next visit. Fenced clean yard, large hottub, close to beach. Extremely helpful in selecting a house and checking in early. The location was nice and the fenced yard an amazing perk for dogs! Cozy and comfortable, well stay here again. Your team was excellent , very nice and very understanding , great people . The property was very well maintained , clean . Had all the things we needed . So 5 stars for it .Tell us about your favorite feature of the property. Everything was beautiful and well taking care . I hope to rent this place again .